Tricia has been an Independent Beauty Consultant with Mary Kay Cosmetics for over 12 years. 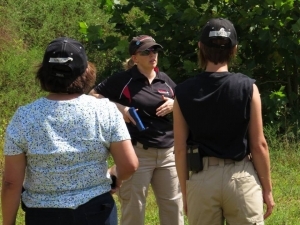 The communication and teaching skills she uses in her own business easily carried over to her role as a firearms instructor. 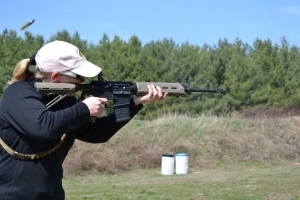 She began her shooting career with Fortress Defense in June 2012 and hasn’t looked back. She quickly earned her NRA Instructor Certification and a few short months later graduated from Rangemaster’s Instructor Development Program. Tricia is now a Staff Instructor with DTI, as well, and assists Vicki Farnam on a regular basis – And she is part of the team at PrettyLoaded.org! 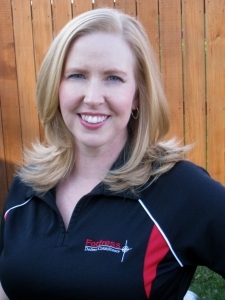 Tricia assists in our Women’s Self-Defense Course, Defensive Pistol (Intro, Level I & II), Force-on-Force, Rifle, and contributes to Speaking Engagements we provide to the community. In addition to her passion for teaching skin care and defensive shooting; Tricia is an avid hiker, competes in triathlons, volunteers at a local art gallery, and fosters dogs through an animal rescue. Tricia specializes in being a badass of all things requiring badassery.